Thanks guys...I enjoy figuring out good workarounds for mistakes (I have used the one above before, unfortunately), and I enjoy photographing/documenting and sharing the process. As an FYI....I am producing 2 additional blades in this series, I have one slated as a backup, in the event we have a heat treat failure, and the other I have a design in mind for a spec knife....having said that, if anyone is interested in one of the additional blades, please let me know. 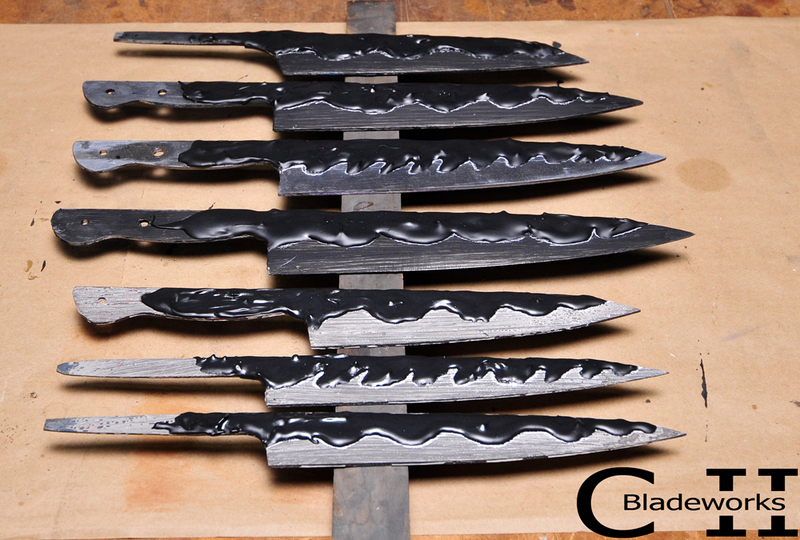 The 3 240mm Western gyutos and several other knives (all W2 steel) are clayed up for the heat treating process. The 4 on the bottom are available. A short video of the claying process...In this video, I clay a smaller blade, not the Western 240mm, just for time saving. What are the lengths/heights on the 4 that are available? These look badass! 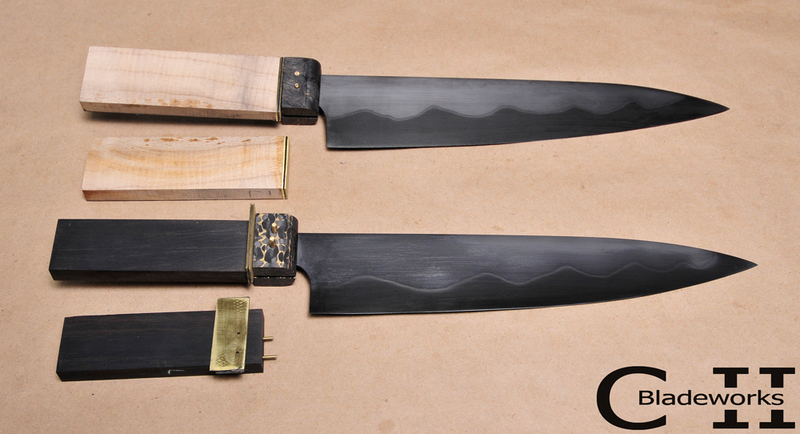 240mm & 180mm western handle, 2x -210mm petty...one is going to a chef in Reykjavik. Really great all the detail you share with us Carter. It's fun seeing all that you guys do and go through to bring us great knives! Thx Jeff...shop is closed....going on 34hrs with no power due to ice storm. Looking to produce some more video content soon. Yeah, we definitely took underground power for granted in Miami. This one hit our area hard...worse than the 20" of snow in mid-December. Got power back this after noon, thx to the linemen from Indiana! Here are the three 245mm western handled W2 gyutos, I spent a bit of time grinding them and getting the profile and edge thinned down. They have a light 220 grit finish at this point. Oh man, those are looking mighty fine! Thanks for posting pics. 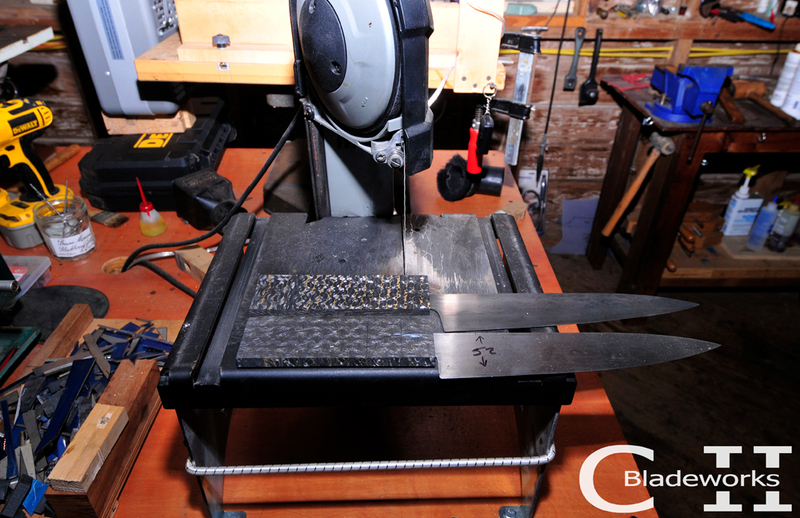 Cutting some really cool carbon fiber for bolsters. I'm fitting up handles on the blades today...they have not been polished since etching. Carter - I'm thinking strongly of going with a differentials hardened knife - can you tell me why the difference in clay depth makes a difference (knife on bottom versus knife on top). Would the bottom knife have a less stiff feel to the blade? I'm still probably in the 52100 camp with a nice black etch, but Jen asked me about this. The 52100 blade you made I have right now is about perfect for stiffness in my use - feels like a much heavier blade but cuts like a laser. Is there something to the depth/width of the clay? If we can figure it out I might well go for "pretty" here - and next year get another 52100. We can differentially harden 52100 or W2, 52100 will just show little to no hamon, but structurally, both steels will be the same. The knives above are identical with regards to the claying, the only difference is the top one has some of the etchant removed. We can do anything from a fully polished blade to gun metal gray or leave as is, like the bottom knife.